This is a student’s work. 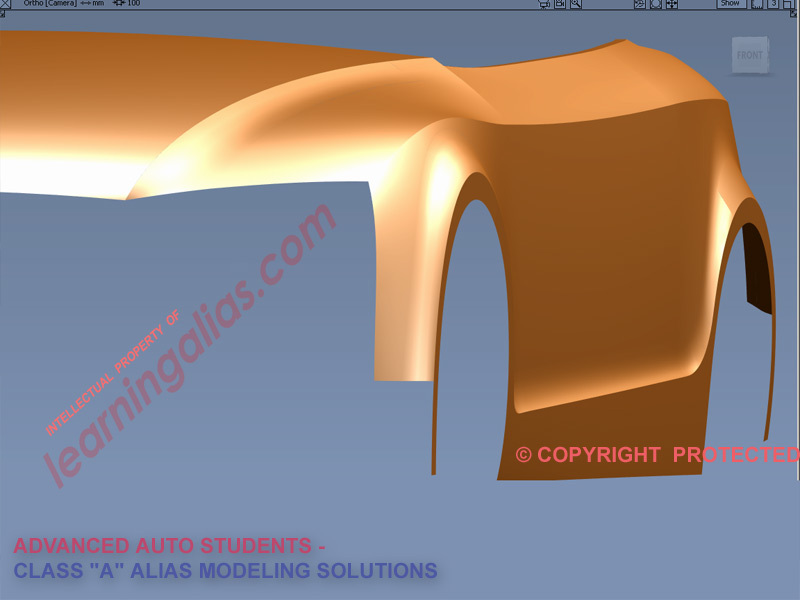 First he had to model the Hood area to Class “A” standards. The next step was to import his wire file into Showcase, where he was able to render it in an Interactive Scene. 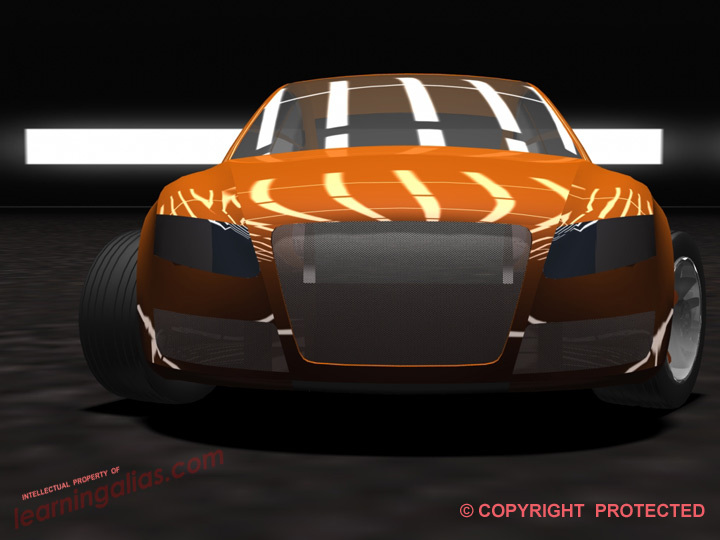 This is his first rendering in Showcase, it’s not perfect, but it’s pretty good. Showcase is much easier to use than Alias for rendering. Cons: You need a very good computer with a FAST processor and 4+ Gig ddr2 RAM. I hope that the student continues the excellent work by adding the finishing details. Employers don’t want to see just concept models, they want to know that the candidate can model to production standards and that they are capable of fully completing the model. And I didn’t have time to build a tyre tread, but I wanted to show you what Showcase is capable of and also how Less can be More, when presenting your work. The complete tyre would have looked clumsy and heavy and by making part of the rim transparent and exploding the disc and NOT showing all the bolts, I think I have made an elegant presentation. Also sticking with “Less is often More”, I avoided the temptation of using a complicated environment and used a simple photographic studio. 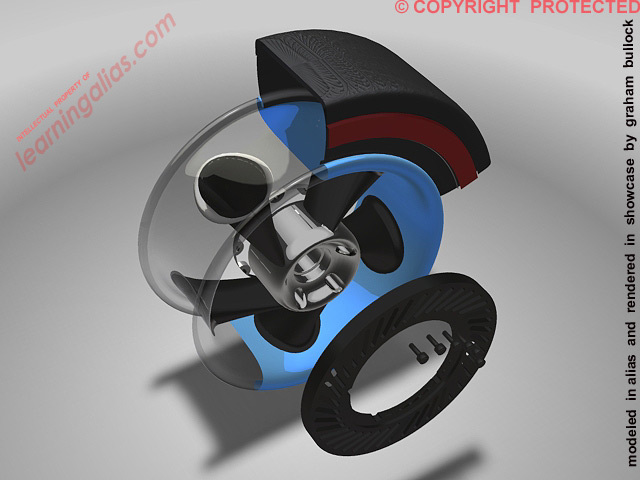 We are now covering Keyshot 5 photo realistic rendering with our own video course. You need a way to show-off your work fully. 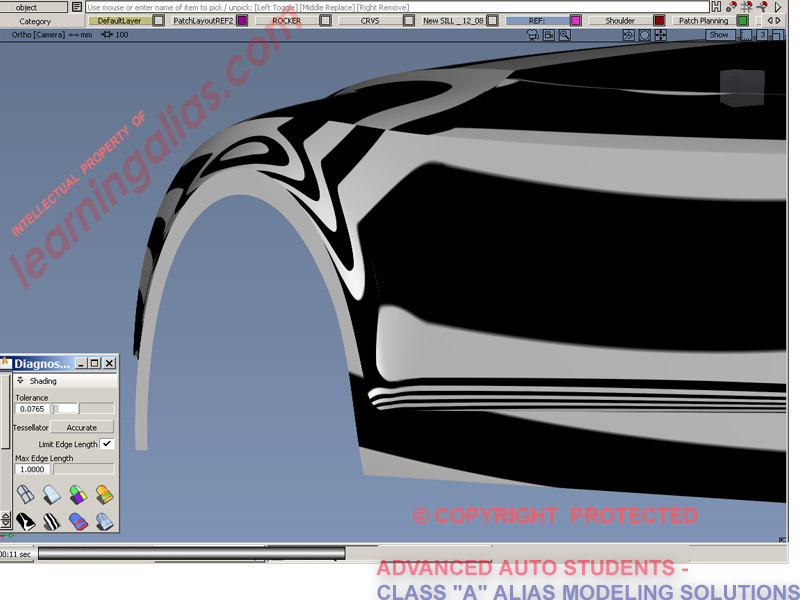 Autodesk Showcase is a great product for doing that, but today I want to show you how you can do it simply in Alias 2010. That Should Do It for the Settings! Paste it into Photoshop or Paint and save it out. Here I have Put the Glass and the black-out surfs. onto a separate layer. I hid the painted surfs. away and then applied a different color and transparency val. 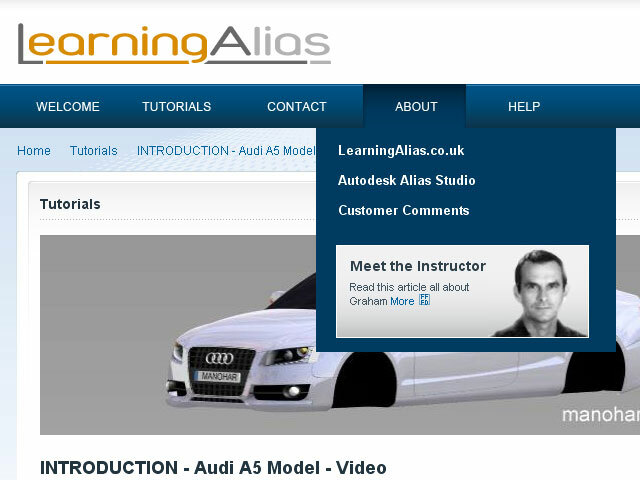 What Skill Sets Will I Be Adding, If I Study Class “A” Surfacing in Alias? Notice how evenly and smoothly the Zebra Stripes run, describing not only the surf. boundary curvature conditions, but also the internal curvature of the surfs. This surf-set comprises just 7 surfs. and they are nearly all BiRails. 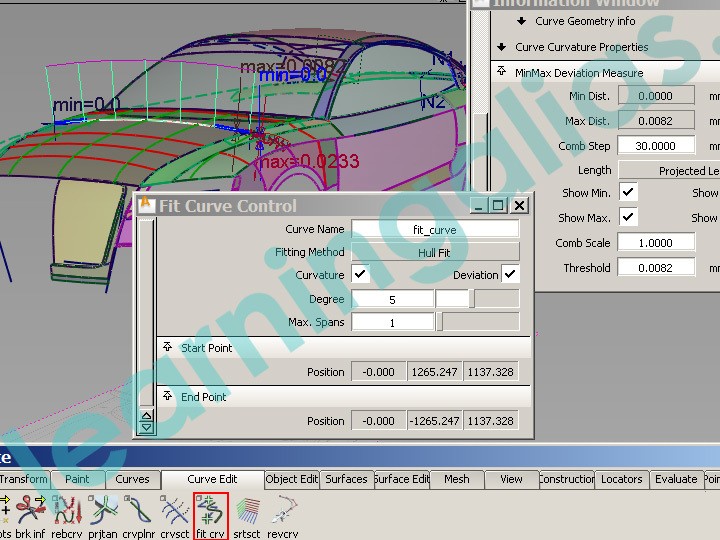 There is always a big back-log of models to be milled in the Automotive Industry, so models with heavy geom. are not wanted. 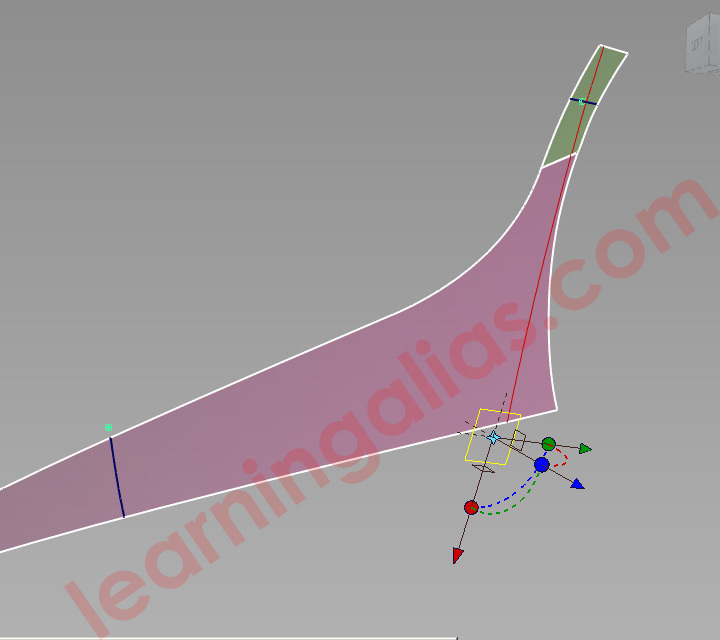 Also if your model has light geom. it may well jump the cue, which your Designer will love you for. 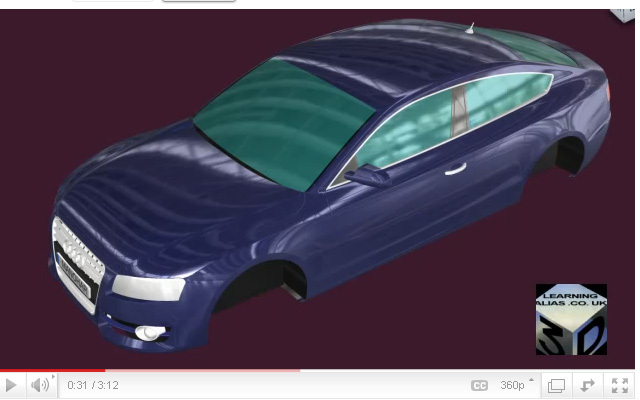 Creating Difficult Surfaces Using Only a Single Span in both U and V.
No bones about it, this is what will get you a job in Automotive Modeling ! 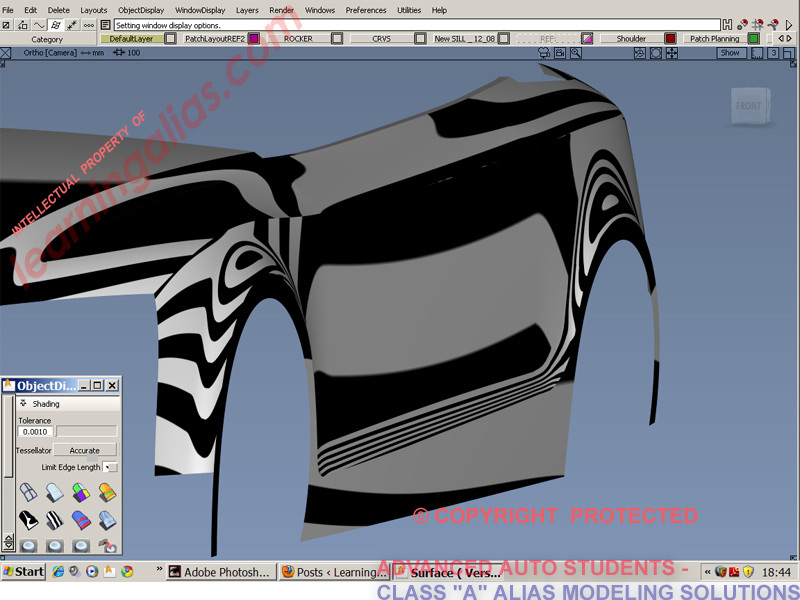 The A5 C pillar, deck and shoulder blend is indeed a challenge for any modeller . 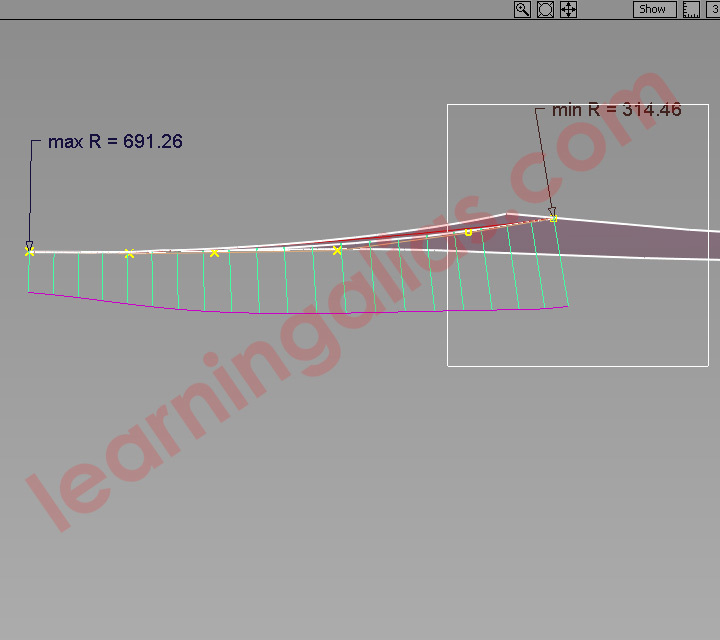 This area of the vehicle comprises 19 patches on the LHS alone and there are very few opportunities to break curvature. There is a fair amount of hand modelling involved. His name is Satoshi Wada. Satoshi is one of the world’s top designers. No longer at Audi he left last year after 11 years during which time he completely changed the face of Audi Design. With Satoshi, every surf. on the car must be a work of art. 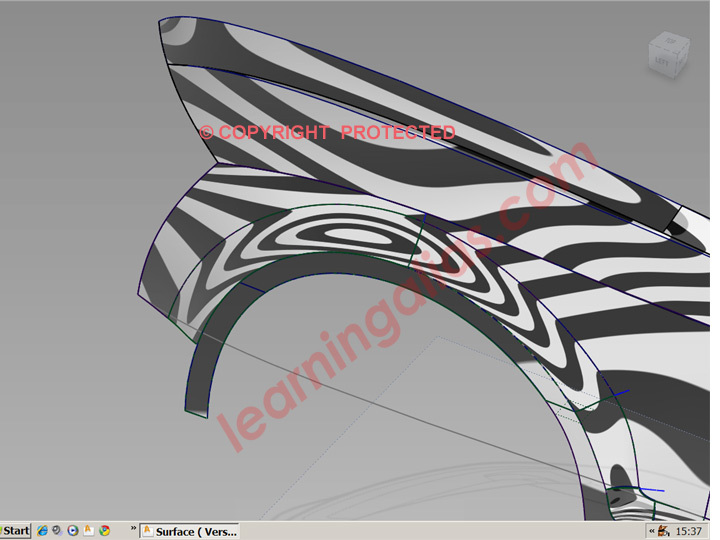 He puts a fantastic amount of design into what used to be just the front and rear apron. 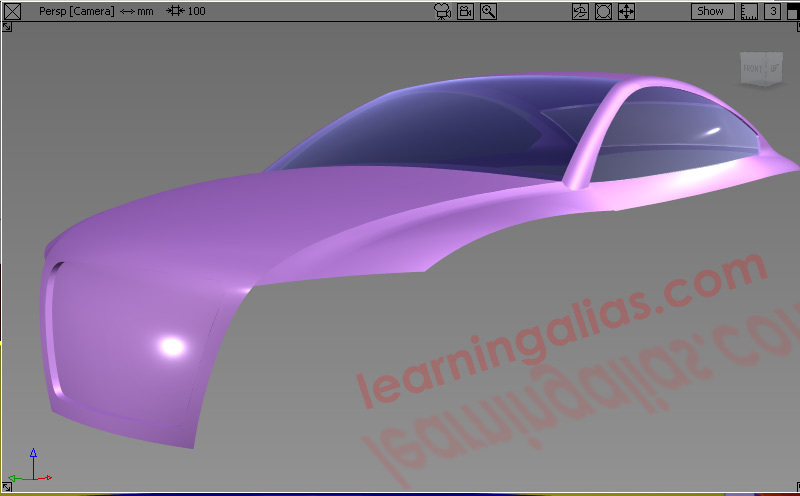 The front apron on this car incorporates 2 spoilers and is very difficult to model. 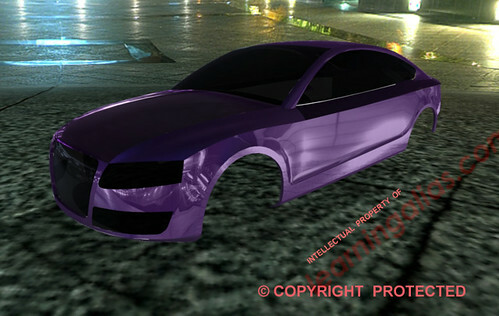 Whilst at Audi, Satoshi designed the “Pikes Peak” and Advantissimo concept cars, the A6, A5, A5_S and the Q7. 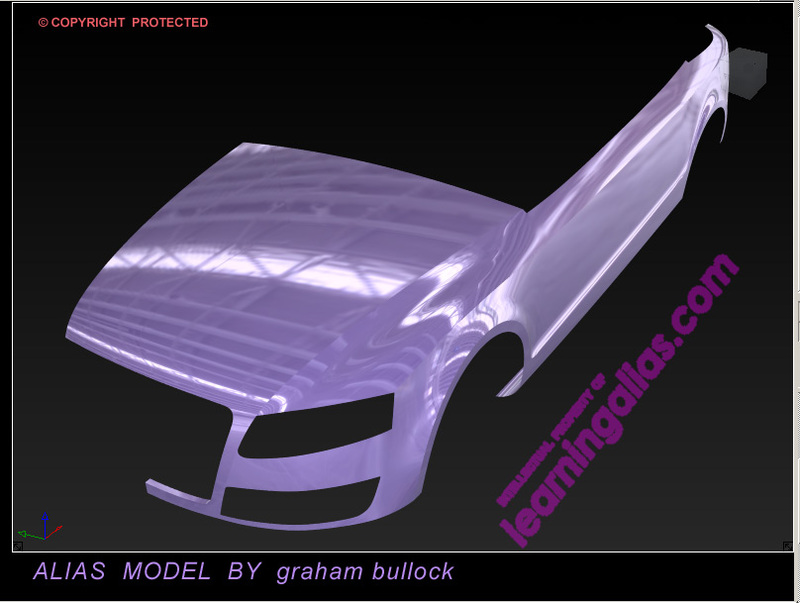 The above model is a WIP and the surfaces show are not final. are now available to members on my NEW website. LIVE NOW! In close n’ dirty, we see the visual indicator mapping the potential x-sec path. Note that if we select multiple surfs. 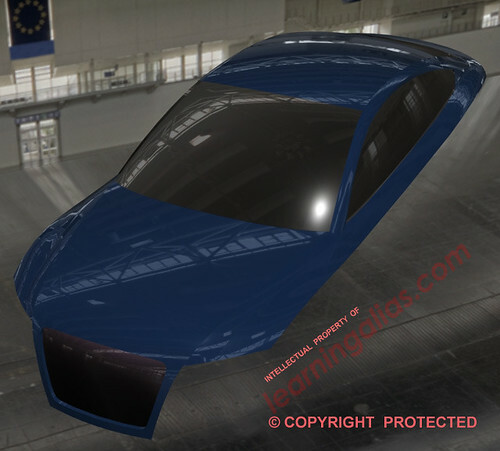 the DSC will create a common crv. spanning all the selected surfs. The Dynamic Section Cont. also will create a construction plane for the x-sec. Here we are in TOP looking at the x-sec in True View. I have converted the geom. created.It was deg.3, 16 spans & is now rationalized to deg.5,1. The crv. is no longer representing the x-sec. 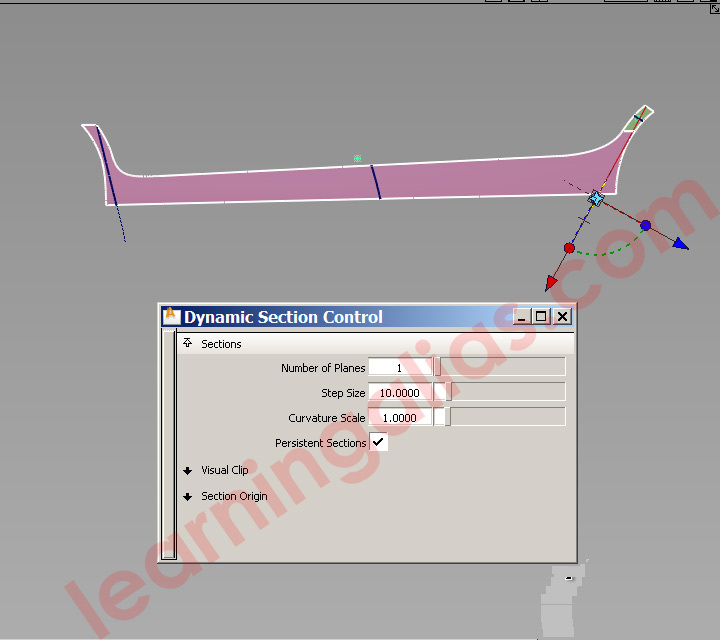 I have sculpted it to produce the precise Comb that I need to create my Class “A” surf. 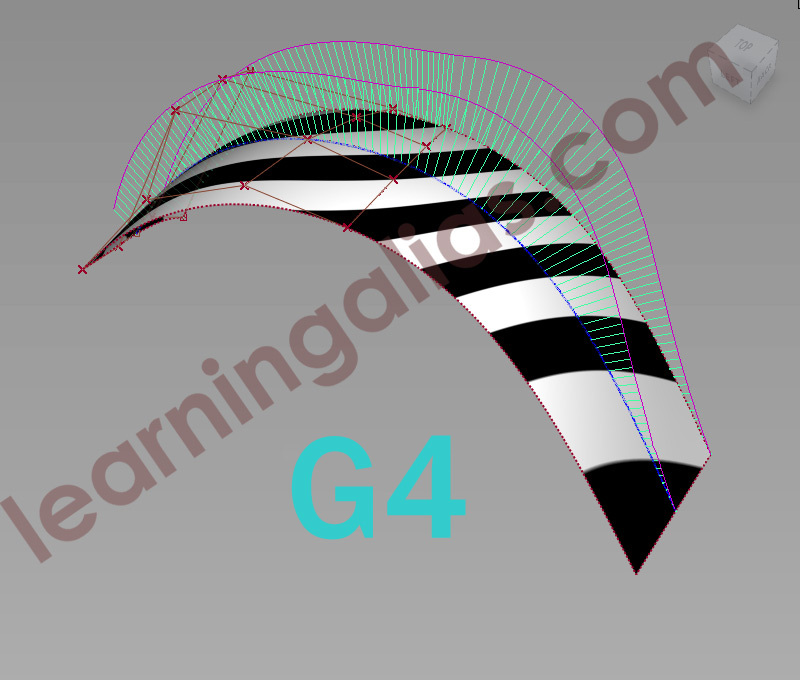 This is G4 curvature. I have built 2 surfaces with deg. 3 crvs. to give me the least number of CV’s to wrestle with. This is a demo. and I usually have to work with say deg. 5,1. which means more Cv’s. This example is G4, which is achieved by aligning 4 rows of Cv’s. 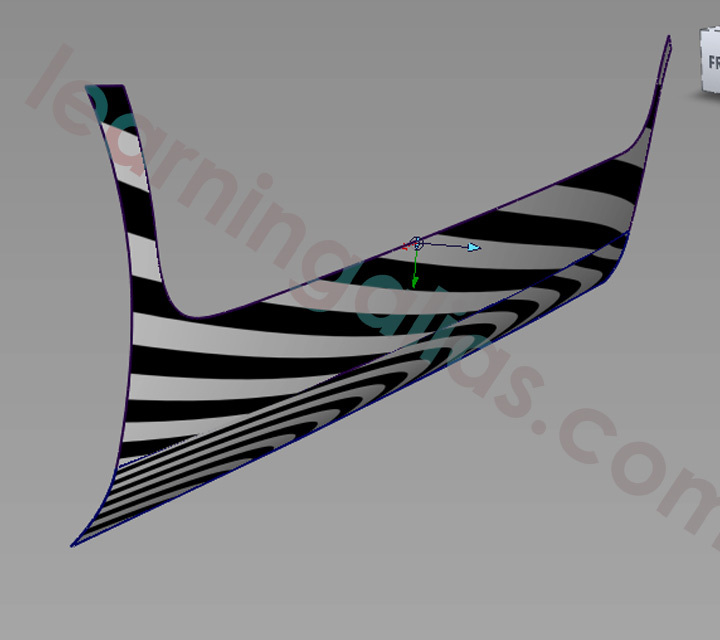 An experienced Class “A” modeller will determine this simply by looking at the Curvature Quills. I don’t have time to tell you more at the moment, but as soon as I come up for air, I will write a post giving more info.